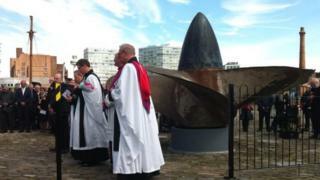 The centenary of the sinking of the Lusitania has been marked by memorial services in Liverpool and Ireland. About 1,200 people died and 771 survived when the British liner was torpedoed by a German submarine on 7 May 1915 during World War One. One of the largest ships in the world, it was sailing from New York to its home port of Liverpool when it was sunk off the coast of Ireland. A minute's silence was held at about 14:10 BST - the time of the attack. The disaster provoked outrage especially in Britain, with rioters targeting German businesses in Merseyside, Manchester and London. Public opinion in the US, which had been officially neutral, was said to have changed after the death of about 130 Americans, although it was another two years before the country declared its official entry into the war, in 1917. Ian Murphy, from Merseyside Maritime Museum, said: "In 1915, Lusitania was the world's most famous ship and the jewel in Liverpool's crown. "Her sinking sent shockwaves around the globe and was said to have influenced America's entry to the war." About 600 people onboard the Lusitania had links with Merseyside. The Reverend Dr Crispin Pailing, rector of Liverpool, said: "A significant number of the crew and passengers had Liverpool connections - there is hardly a street in the Vauxhall area that wasn't affected." The ship's owner Cunard has commissioned a memorial plaque, which was dedicated during a service at Liverpool Parish Church. Actors Joe McGann and Roy Carruthers also read first-hand accounts from survivors. For the first time, a painting by the artist Anthony Brown, whose great-grandfather was on the Lusitania's final voyage, is now on display. A minute's silence followed a walk of remembrance to the Lusitania's salvaged propeller, now located at the city's Pier Head. US entrepreneur Gregg Bemis, who owns the shipwreck of the Lusitania, and diver Eoin McGarry have also placed a plaque on the liner's wreck off the coast of Ireland. The disaster was also marked at the Irish port of Cobh, where many victims were buried after the tragedy. Last weekend, a service was held in the Isle of Man from where a fishing boat rescued about 150 people. iWonder - Who was to blame for the sinking of the Lusitania?